The assassination of President John F. Kennedy was one of those historic moments when I remember exactly where I was, an event that changed the world as I had known it. I was a freshman, a naive freshman, in college when it happened and our whole world changed in so many ways that day. I’m not one to obsess over the details because I lived through them, one of the first events we experienced through radio and television news, continuous news, in a time when the news only came on at five and ten and we relied on magazines and newspapers for in depth reporting, a time now over 50 years ago. In May, 1966, some college friends and I took off for Galveston, TX for a weekend at the beach, really pretty tame, but wild for us. 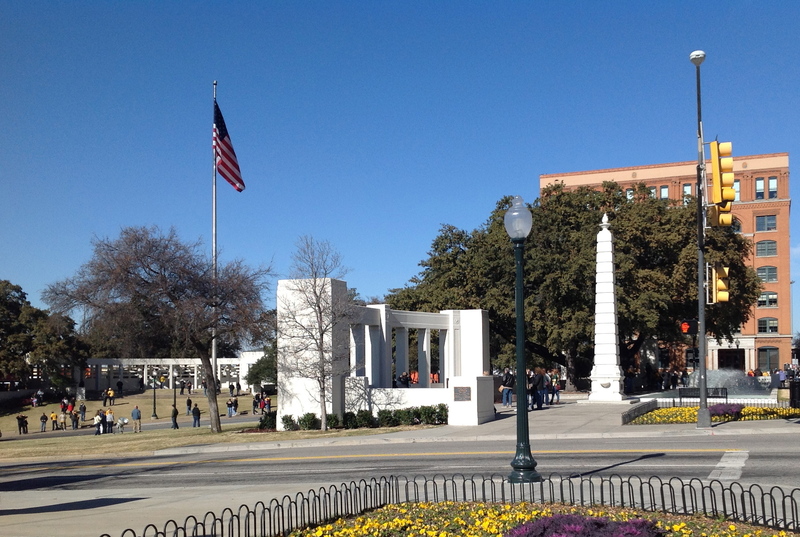 Going through Dallas, which was not nearly as complicated then as it is today, we stopped at Dealey Plaza, out of curiosity as much as anything. Martin Luther King and Bobby Kennedy were still alive and we were probably under the illusion that the death of our President was pretty much an aberration. Here is all there was on the Plaza in the predawn hours that day in May that we visited without crowds or fanfare. Although I knew there was now a museum, I hadn’t rushed to visit, so I’m still somewhat surprised that I felt the urge to go this weekend with friends. We were in town for a football bowl game and were filling our afternoon, navigating the overlapping amusement park of freeways in and around Dallas, a city of glass and flash. The end of the holiday season, the first weekend of the new year, and the lines were forming just to get tickets for the timed entry. Tickets in hand, we visited the plaza while waiting. My two friends were in junior high or high school in 1963, so we had different memories to share, because you always have to talk about where you were when you heard the news. You have to. 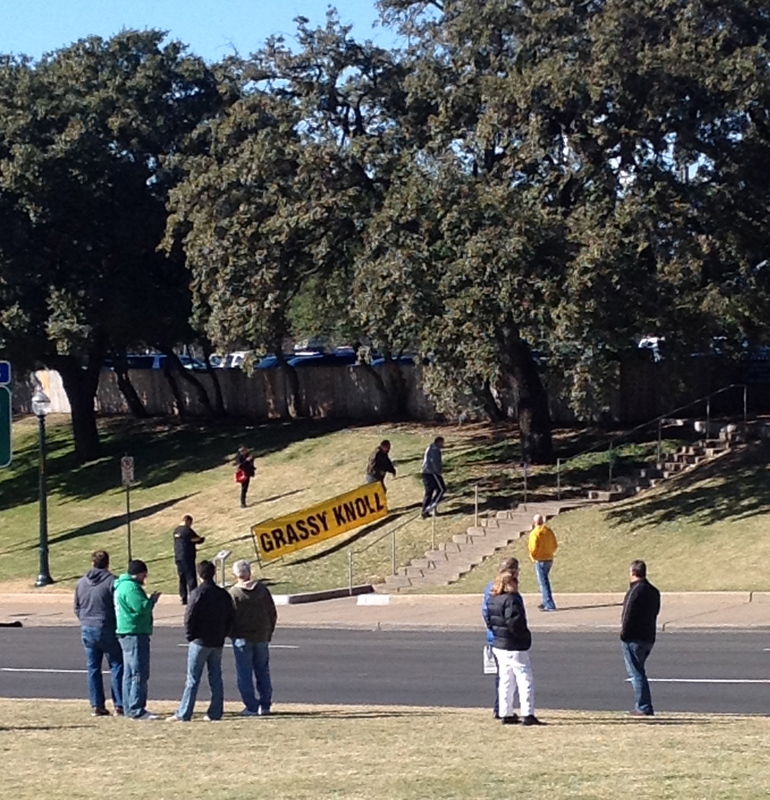 There are places that you visit that are instantly familiar, instantly brought to life from the images you’ve carried with you, and Dealey Plaza is one of those. The only thing that is really different is that we watched it all in black and white in 1963 and this was a bright sunny Texas day, the site coming alive with color. 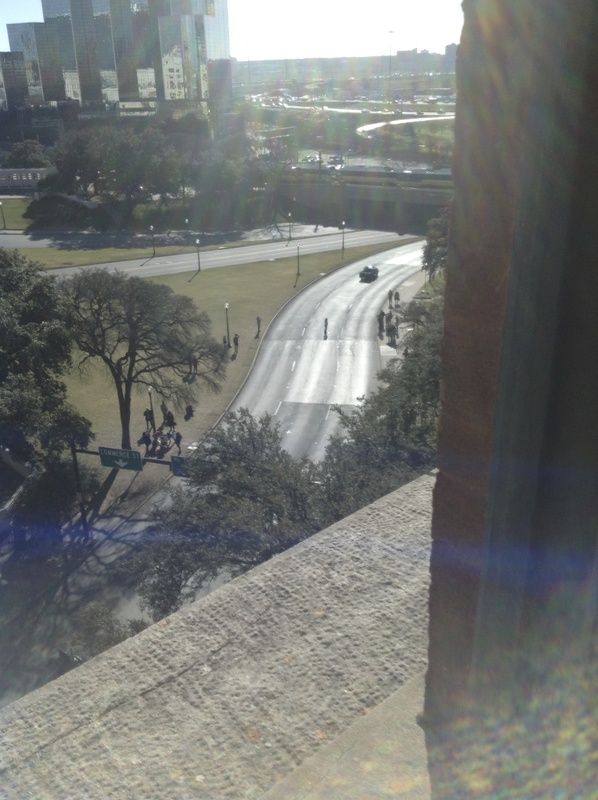 The trees, young in the Zapruder films, are now 50 years older and obscure some of the views. 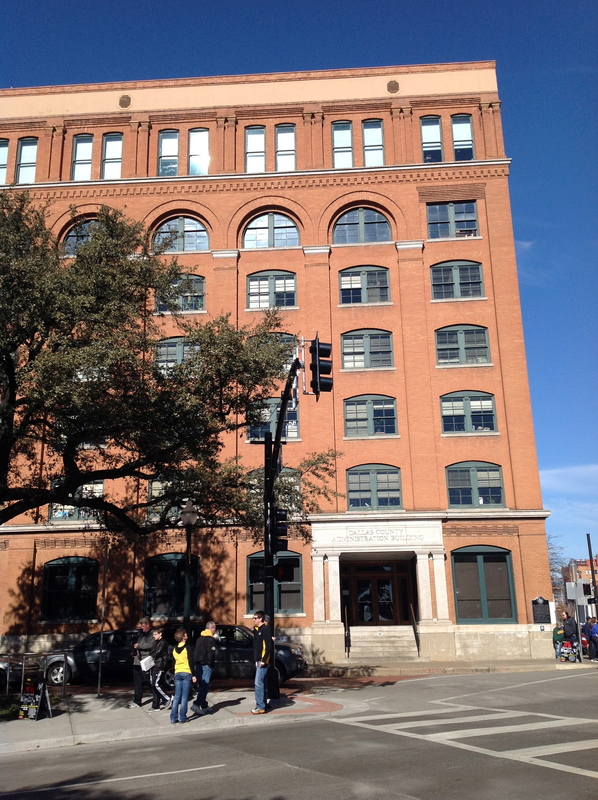 Turning to look at the former Texas School Book Depository, looking up at the window, I felt a twinge, an eerie feeling inside. Walking across the plaza, we had someone take our picture, not because of where we were but because we wanted a photo together. Actually, you can’t even tell where we were. I took a look at the entire scene, so familiar, behind us, complete with people standing on the slope. We spent the rest of our time before we could go in visiting the gift shops, two of them. There were books and replicas of the famous Saturday Evening Post with the cover portrait of Kennedy by Norman Rockwell, t-shirts, post cards, mugs and jewelry (I guess replicas of what Jackie wore? ), and other mostly tasteful items. Having owned a gift shop, I have to wonder what I would think appropriate for remembering this place, this event. Not sure I would wear a patch on my jacket of the Book Depository. The Sixth Floor Museum, as it is called, was well organized and nicely done. I didn’t take the audio guides, choosing to watch the crowds. Skimming the information I already knew so well, I began to watch the people, most way too young to have my experience with the event, most knowing this the way I know World War II, through my history classes and parents and grandparents. There were young couple with babies in strollers, college students, middle aged people, all kinds of people, all walking along, reading history as I had lived it. Each reaction or response was unique to that person at this time in their life, based on where they had come from, what they already knew, who they are. We were all sharing this exhibit in our own way. I had a brief flash of my visit to Graceland this past summer, a visit that occurred at the end of Elvis Week, on the anniversary of his death, by chance. 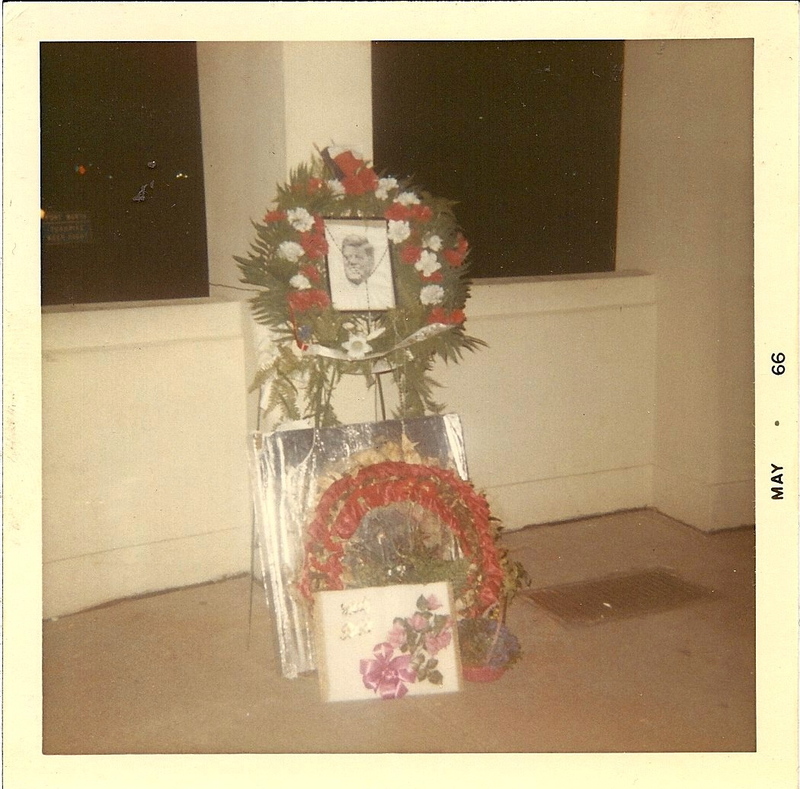 Another moment in my life I remember – hearing about Elvis’ death. The crowds that weekend in Memphis were quiet with their audio guides and walking by the grave, reverential. It was a little noisier here in this museum, not loud, but voices here and there. The contrast and similarities of my two pilgrimages was interesting, slightly amusing. Walking quickly through the history, I came to the site of the shooting. Glassed off so you can’t stand on the actual spot, the boxes of school books stacked as they were found that day, the window slightly open with a disguised camera now watching the plaza, I had a slightly queasy feeling. It was pretty real. You can’t take pictures there, but you can stand by the next windows and look out onto the road, seeing the same thing Oswald saw with taller trees now. You realize that the car wasn’t very far away, that wasn’t a very long shot for the rifle really. Moving along, there were the actual FBI models of the site and the gun shot trajectories, later found to be incorrect, films and displays of all the aftermath, Jack Ruby’s suit that we know so well from the photos and films, Zapruder’s camera and the film dissected and discussed, and on to the investigations, the books written, the conspiracy theories. The two film rooms were the films of the memorial service and films about the conspiracy. I didn’t watch either, all of it feeling too far back and too familiar at the same time. I wandered up to the 7th floor, a lovely mostly empty room where you can look out on the plaza and the familiar road and take pictures or reflect. It was very quiet on this floor with few people. Looking down at the street where an X marks the spot, I realized that people were waiting for traffic to stop and then running out to pose for pictures on the X. There were individual, groups, people doing silly things. I don’t even know what I thought other that it seemed disturbing to me. I realized they didn’t live the time like I did and it wasn’t exactly disrespectful, but I had a hard time relating. The bare X was enough to make me stop, stare down from the window and reflect on what happened there, but I sure didn’t want to go stand on it. Walking back down the stairs, I watched people having their pictures made under the original Texas School Book Depository sign. Again, a little eerie to me. There was a display towards the end of the exhibits, a board that showed the memorials at the spot where Martin Luther King was assassinated, Pearl Harbor, the Oklahoma City Bombing Memorial and something else, reminding us that these are important sites for us to preserve so that we can remember, we can educate and we can discuss the effect of these horrors, this violence, on society. I agree because I am ever hopeful that men and women will someday learn to live in peace. If we quit hoping and only acknowledge that there has always been violence between human beings, then how can we proceed, why are we living? We have to always hope and work towards that goal. Don’t we? Even having our picture made smiling seemed off somehow. It’s OK for noting the visit and the group–but it was not, say, the Golden Gate Bridge. Strangely, I did not have a similar feeling for the Alamo yet did for the various memorials in Washington, D.C. Thanks for the post. Much to ponder so happy for the gift of time today to do that. I agree. I had the same feelings in D.C., especially Vietnam wall. Since I didn’t live through the Alamo, it didn’t leave me with the same vibe, although I did read the names of all those who died with admiration that they came from so far to fight there. Enjoyed being with you thoroughly!